The Great Vowel Shift was a series of changes in the pronunciation of the English language that took place primarily between 1350 and the 1600s and 1700s, beginning in southern England and today having influenced effectively all dialects of English. Through this vowel shift, all Middle English long vowels changed their pronunciation. Some consonant sounds changed as well, particularly those that became silent; the term Great Vowel Shift is sometimes used to include these consonant changes. English spelling began to become standardized in the 15th and 16th centuries, and the Great Vowel Shift is the major reason English spellings now often considerably deviate from their representation of English pronunciations. The Great Vowel Shift was first studied by Otto Jespersen (1860–1943), a Danish linguist and Anglicist, who coined the term. The causes of the Great Vowel Shift have been a source of intense scholarly debate, and, as yet, there is no firm consensus. The greatest changes occurred during the 15th and 16th centuries. Some scholars have argued that the rapid migration of peoples from northern England to the southeast following the Black Death caused a mixing of accents that forced a change in the standard London vernacular. Others argue that the influx of French loanwords was a major factor in the shift. Yet others assert that because of the increasing prestige of French pronunciations among the middle classes (perhaps related to the English aristocracy's switching from French to English around this time), a process of hypercorrection may have started a shift that unintentionally resulted in vowel pronunciations that were less like French instead of more. An opposing theory states that the wars with France and general anti-French sentiments caused hypercorrection deliberately to make English sound less like French. The main difference between the pronunciation of Middle English in the year 1400 and Modern English (Received Pronunciation) is in the value of the long vowels. Long vowels in Middle English had "continental" values, much like those in Italian and Standard German; in standard Modern English, they have entirely different pronunciations. The differing pronunciations of English vowel letters do not stem from the Great Shift as such but from the fact that English spelling failed to be adapted to the changes. German had undergone vowel changes quite similar to the Great Shift in a slightly earlier period but the spelling was changed accordingly (e.g. Middle High German bīzen → modern German beißen "to bite"). Before the Great Vowel Shift, Middle English in Southern England had seven long vowels, /iː eː ɛː aː ɔː oː uː/. The vowels occurred in the words bite, meet, meat, mate, boat, boot, out and many more. The words had very different pronunciations in Middle English from their pronunciations in Modern English. Long i in bite was pronounced as /iː/ so Middle English bite sounded like Modern English beet /biːt/; long e in meet was pronounced as /eː/ so Middle English meet sounded similar to Modern English mate /meɪt/; long a in mate was pronounced as /aː/, with a vowel like Scottish English ah in father [ˈfaːðər] or General American short o in cot /kɑːt/; and long o in boot was pronounced as /oː/, similar to modern oa in General American boat /oʊ/. In addition, Middle English had a long /ɛː/ in beat, like modern short e in bed but pronounced longer, and a long /ɔː/ in boat. After around 1300, the long vowels of Middle English began changing in pronunciation. The two close vowels, /iː uː/, became diphthongs (vowel breaking), and the other five, /eː ɛː aː ɔː oː/, underwent an increase in tongue height (raising). They occurred over several centuries and can be divided into two phases. The first phase affected the close vowels /iː uː/ and the close-mid vowels /eː oː/: /eː oː/ were raised to /iː uː/, and /iː uː/ became the diphthongs /ei ou/ or /əi əu/. The second phase affected the open vowel /aː/ and the open-mid vowels /ɛː ɔː/: /aː ɛː ɔː/ were raised, in most cases changing to /eː iː oː/. The Great Vowel Shift changed vowels without merger so Middle English before the vowel shift had the same number of vowel phonemes as Early Modern English after the vowel shift. After the Great Vowel Shift, some vowel phonemes began merging. Immediately after the Great Vowel Shift, the vowels of meet and meat were different, but they are merged in Modern English, and both words are pronounced as /miːt/. However, during the 16th and the 17th centuries, there were many different mergers, and some mergers can be seen in individual Modern English words like great, which is pronounced with the vowel /eɪ/ as in mate rather than the vowel /iː/ as in meat. This is a simplified picture of the changes that happened between late Middle English and today's English. 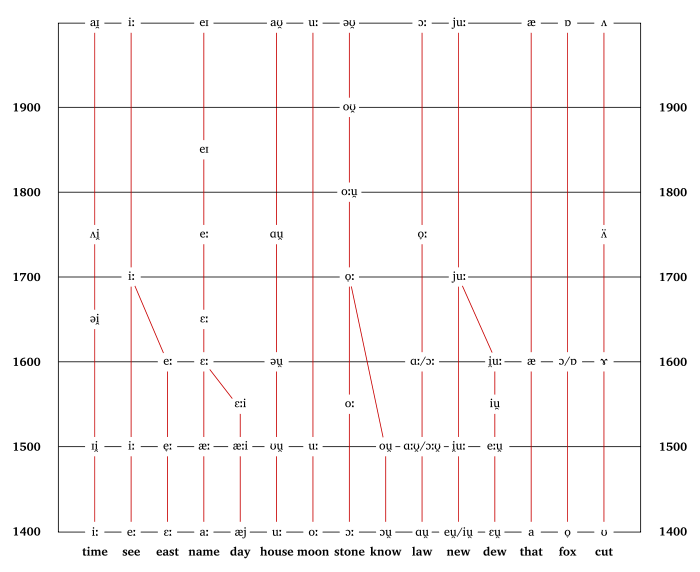 Pronunciations in 1400, 1500, 1600, and 1900 are shown. To hear recordings of the sounds, click the phonetic symbols. Before labial consonants and also after /j/, /uː/ did not shift, and /uː/ remains as in soup and room (its Middle English spelling was roum). The first phase of the Great Vowel Shift affected the Middle English close-mid vowels /eː oː/, as in beet and boot, and the close vowels /iː uː/, as in bite and out. The close-mid vowels /eː oː/ became close /iː uː/, and the close vowels /iː uː/ became diphthongs. The first phase was complete in 1500, meaning that by that time, words like beet and boot had lost their Middle English pronunciation, and were pronounced with the same vowels as in Modern English. The words bite and out were pronounced with diphthongs, but not the same diphthongs as in Modern English. Scholars agree that the Middle English close vowels /iː uː/ became diphthongs around the year 1500, but disagree about what diphthongs they changed to. According to Lass, the words bite and out after diphthongization were pronounced as /beit/ and /out/, similar to American English bait /beɪt/ and oat /oʊt/. Later, the diphthongs /ei ou/ shifted to /ɛi ɔu/, then /əi əu/, and finally to Modern English /aɪ aʊ/. This sequence of events is supported by the testimony of orthoepists before Hodges in 1644. Evidence from northern English and Scots (see below) suggests that the close-mid vowels /eː oː/ were the first to shift. As the Middle English vowels /eː oː/ were raised towards /iː uː/, they forced the original Middle English /iː uː/ out of place and caused them to become diphthongs /ei ou/. This type of sound change, in which one vowel's pronunciation shifts so that it is pronounced like a second vowel, and the second vowel is forced to change its pronunciation, is called a push chain. However, according to professor Jürgen Handke, for some time, there was a phonetic split between words with the vowel /iː/ and the diphthong /əi/, in words where the Middle English /iː/ shifted to the Modern English /aɪ/. For an example, high was pronounced with the vowel /iː/, and like and my were pronounced with the diphthong /əi/. Therefore, for logical reasons, the close vowels /iː uː/ could have diphthongized before the close-mid vowels /eː oː/ raised. Otherwise, high would probably rhyme with thee rather than my. This type of chain is called a drag chain. During the first and the second phases of the Great Vowel Shift, long vowels were shifted without merging with other vowels, but after the second phase, several vowels merged. The later changes also involved the Middle English diphthong /ai/, as in day, which had monophthongised to /ɛː/, and merged with Middle English /aː/ as in mate or /ɛː/ as in meat. During the 16th and 17th centuries, several different pronunciation variants existed among different parts of the population for words like meet, meat, mate, and day. In each pronunciation variant, different pairs or trios of words were merged in pronunciation. Four different pronunciation variants are shown in the table below. The fourth pronunciation variant gave rise to Modern English pronunciation. In Modern English, meet and meat are merged in pronunciation and both have the vowel /iː/, and mate and day are merged with the diphthong /eɪ/, which developed from the 16th-century long vowel /eː/. Modern English typically has the meet–meat merger: both meet and meat are pronounced with the vowel /iː/. Words like great and steak, however, have merged with mate and are pronounced with the vowel /eɪ/, which developed from the /eː/ shown in the table above. The Great Vowel Shift affected other dialects as well as the standard English of southern England but in different ways. In Northern England, the shift did not operate on the long back vowels because they had undergone an earlier shift. Similarly, the Scots language in Scotland had a different vowel system before the Great Vowel Shift, as /oː/ had shifted to /øː/ in Early Scots. In the Scots equivalent of the Great Vowel Shift, the long vowels /iː/, /eː/ and /aː/ shifted to /ei/, /iː/ and /eː/ by the Middle Scots period and /uː/ remained unaffected. In both Northern and Southern English, the first step of the Great Vowel Shift raised the close-mid vowels to become close. Northern Middle English had two close-mid vowels – /eː/ in feet and /øː/ in boot – which were raised to /iː/ and /yː/. Later on, Northern English /yː/ changed to /iː/, so that boot has the same vowel as feet. Southern Middle English had two close-mid vowels – /eː/ in feet and /oː/ in boot – which were raised to /iː/ and /uː/. In Southern English, the close vowels /iː/ in bite and /uː/ in house shifted to become diphthongs, but in Northern English, /iː/ in bite shifted but /uː/ in house did not. If the difference between the Northern and Southern vowel shifts is caused by the vowel systems at the time of the Great Vowel Shift, /uː/ did not shift because there was no back mid vowel /oː/ in Northern English. In Southern English, shifting of /oː/ to /uː/ could have caused diphthongisation of original /uː/, but because Northern English had no back close-mid vowel /oː/ to shift, the back close vowel /uː/ did not diphthongise. Not all words underwent certain phases of the Great Vowel Shift. Examples are father, which failed to become /ɛː/, and broad, which failed to become /oʊ/. The word room, which was spelled as roum in Middle English, retains its Middle English pronunciation. It is an exception to the shifting of /uː/ to /aʊ/ because it is followed by m, a labial consonant. The class ea did not take the step to /iː/ in several words. The presence of /r/ in swear and bear caused the vowel quality to be retained but not in the cases of hear and near. Shortening of long vowels at various stages produced further complications: ea is again a good example by shortening commonly before coronal consonants such as d and th, thus: dead, head, threat, wealth etc. (That is known as the bred–bread merger.) The oo was shortened from /uː/ to /ʊ/, in many cases before k, d and less commonly t: book, foot, good, etc. Some words subsequently changed from /ʊ/ to /ʌ/: blood, flood. Similar but older shortening occurred for some instances of ou: could. Some loanwords, such as soufflé and umlaut, have retained a spelling from their origin language that may seem similar to the previous examples; but, since they were not a part of English at the time of the Great Vowel Shift, they are not actually exceptions to the shift. During this same period, there were a number of consonant changes, particularly changes that were in combination with the vowel changes, or cases of silencing of consonants. An often-cited example is the word knight, which in Middle English was pronounced /kni:xt/. The k and the gh were silenced, but additionally the i changed its value to /aɪ/. This vowel shift, of course, was not independent of the consonant shift as it was the combined sound /ix/ that actually made the transition to /aɪ/. The printing press was introduced to England in the 1470s by William Caxton and later Richard Pynson. The adoption and use of the printing press accelerated the process of standardization of English spelling, which continued into the 16th century. The standard spellings were those of Middle English pronunciation, and spelling conventions continued from Old English. However, the Middle English spellings were retained into Modern English while the Great Vowel Shift was taking place, which caused some of the peculiarities of Modern English spelling in relation to vowels. ^ Centralizing to /ɨi ɨu/ and then lowering to /əi əu/ argued by Stockwell (1961). ^ Stockwell, Robert (2002). "How much shifting actually occurred in the historical English vowel shift?" (PDF). In Minkova, Donka; Stockwell, Robert (eds.). Studies in the History of the English Language: A Millennial Perspective. Mouton de Gruyter. ISBN 3-11-017368-9. ^ Labov, William (1994). Principles of Linguistic Change. Blackwell Publishing. p. 145. ISBN 0-631-17914-3. ^ Millward, C.M. ; Hayes, Mary (2011). A Biography of the English Language (3rd ed.). Wadsworth Publishing. p. 250. ISBN 978-0495906414. ^ Nevalainen, Terttu; Traugott, Elizabeth Closs, eds. (2012). The Oxford Handbook of the History of English. Oxford University Press. p. 794. ASIN B009UU4P66. ^ Asya Pereltsvaig (Aug 3, 2010). "Great Vowel Shift — part 3". Languages of the World. ^ a b Lass 2000, p. 72. ^ Wheeler, L Kip. "Middle English consonant sounds" (PDF). ^ a b c Lass 2000, pp. 80–83. ^ a b Lass 2000, pp. 83–85. ^ a b c Görlach 1991, pp. 68–69. ^ Labov, William; Ash, Sharon; Boberg, Charles (2006). The Atlas of North American English. Berlin: Mouton-de Gruyter. p. 14. ISBN 3-11-016746-8. ^ a b Lass 2000, pp. 74–77. ^ Jürgen Handke (Dec 7, 2012). "PHY117 – The Great Vowel Shift". YouTube. The Virtual Linguistics Campus. ^ Wales, K (2006). Northern English: a cultural and social history. Cambridge: Cambridge University. p. 48. ^ Olague, Susana Llamas. "Printers, Orthoepists, and Standardized English". CHASS. Retrieved December 30, 2017. Baugh, Alfred C.; Cable, Thomas (1993). A History of the English Language (4 ed.). Englewood Cliffs, New Jersey: Prentice-Hall. Cable, Thomas (1983). A Companion to Baugh & Cable's History of the English Language. Englewood Cliffs, New Jersey: Prentice-Hall. Cercignani, Fausto (1981). Shakespeare's Works and Elizabethan Pronunciation. Oxford: Clarendon Press. Freeborn, Dennis (1992). From Old English to Standard English: A Course Book in Language Variation Across Time. Ottawa, Canada: University of Ottawa Press. Görlach, Manfred (1991). Introduction to Early Modern English. Cambridge University Press. Kökeritz, Helge (1953). Shakespeare's Pronunciation. New Haven: Yale University Press. Lass, Roger (2000). "Chapter 3: Phonology and Morphology". In Lass, Roger (ed.). The Cambridge History of the English Language, Volume III: 1476–1776. Cambridge University Press. pp. 56–186. Millward, Celia (1996). A Biography of the English Language (2 ed.). Fort Worth: Harcourt Brace. Pyles, Thomas; Algeo, John (1993). The Origins and Development of the English Language (4 ed.). Orlando, FL: Harcourt Brace & Co.